Day 4 was entirely dedicated to the International Criminal Court (ICC). As I am passionate about the ICC and International Criminal Justice, this day promised to be full of exciting discoveries and discussions. I was particularly looking forward to visiting the ICC, which I’d seen so many times in pictures but never in reality. Today continued the intense discussions that were held the previous day on the successes and challenges faced by the ICC and International Criminal Justice. The day started with an introduction to the ICC as an institution by Dr. Kevin Coffey. The most interesting part of this introduction, in my view, was definitely the different aspects related to the expectations placed on the ICC by the different States which have ratified the Rome Statute. We then split into several small groups to discuss the most current challenge of the ICC: the Palestine question. The group task was a simulation on the Israel/Palestine conflict to determine whether the ICC Office of the Prosecutor should open an investigation on the crimes committed after July 2014. The simulation could not have been more topical as news reports announced on the same day that Israel would be willing to open talks with the ICC prosecutor. Discussions in the group were very enlightening thanks to the diversity of the professional backgrounds we were all coming from. One of the major questions confronting the group was how to reconcile justice for the crimes committed in Israel/Palestine against civilians with the intensity of the politics surrounding this conflict. In the end, this brought us back to the wicked question: should justice be favoured over peace or vice versa? This question is so controversial that, in the end, the group could not reach a common answer on whether the ICC OTP should open an investigation in Palestine. Half of the group was in favour whereas the other half argued that this was not the right time to open an investigation. That was a really great experience because it clearly reflected the divide opposing leaders having to deal with this question at the ICC and/or the Security Council. 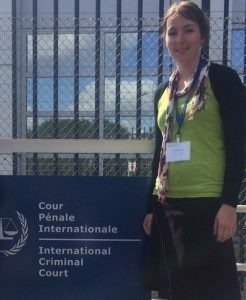 After lunch, we headed to the ICC to see where the pursuit of justice to prosecute the worst international criminals actually takes place. Upon entering, we were welcomed by an impressive selection of pictures of the different chiefs of staff of the ICC, including the Presidency, the Registrar, the Judge, and the Office of the Prosecutor. Following an introductory video on the ICC and a presentation from a representative of the ICC OTP, we continued on to the courtroom. Unfortunately, there was no hearing taking place on that day, but we were given a description of the different elements in the courtroom instead. I was particularly impressed by the care given to protecting victims and witnesses in the courtroom and outside. There are, of course, many measures to protect the witnesses from being seen by the public but I was not aware, before actually visiting the ICC, that they could also be assisted by a psychologist within the courtroom when testifying. Another interesting aspect of the court that I have noticed by physically seeing what the courtroom looks like is how much the ICC proceedings rely on technology. I have found this very fascinating. Technology is truly facilitating the interactions between the different actors in the courtroom. All the information exchanged in the courtroom is computerised. For example, the witnesses or victims have the ability to identify evidence on a touchscreen, and the image would then be instantly transmitted to the Defence and Prosecutor’s team. Technology also allows anonymising witnesses and victims for their security. I think it is great that the ICC as a modern court embraces technology. However, this raises the question of whether there may be an increased risk of hacking the information exchanged in the courtroom, putting at risk the witnesses and the victims. Today was really useful to get a more concrete perspective of the issues that were covered over the past sessions and to complement discussions and lectures by visiting the heart of International Criminal Justice.